Monday was the yearly trip to Bentham Auction Mart to go and buy some Dalesbred tups. 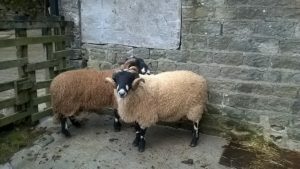 This is the first of just two of the Association’s tup sales, with the second at Skipton in a week’s time. The sale consists of three age classes: aged tups, tup lambs and also shearling tups. The sale was bigger than usual: there were over 200 tups there – normally it’s only around 180 – so the sale went on longer than normal. We don’t sell our shearling tups at Bentham because this is only our third year of selling them, so we go to Skipton as it is a smaller sale. Buying Dalesbred tups is getting harder as there are less blood lines. Even though the breed is becoming more popular there are less tup breeders so buying them is becoming a task. Everyone who is a member of the Dalesbred Sheep Breeders Association has an individual flock number, so if you breed a tup it has a tag in with your flock number on and its own individual number. As well as each tup having its individual number, it also has its Sire’s number (the tup which it is by). The Dam’s number (which is it mother’s number) may just be the flock number as each ewe isn’t individually tagged. Also the Dam’s sire (the ewe’s father) is stated as what each ewe is by is just as important as what each tup is by. It is important that we don’t get the same blood as we don’t want any lambs and ewes interbred because this can cause problems in the stock. We don’t buy any tups that have the same flock number. Instead we buy tups with different numbers to avoid having problems. We bought 2 tups, which are both for our moor sheep as we have tups from previous years for all the other ewes. One of the tups that we have bought is one of the cleanest blood lines for us. This is a less common blood line, so hopefully as we are a new breeder we may be able to produce a tup with blood that isn’t as common as some of the blood lines that are about at the moment. 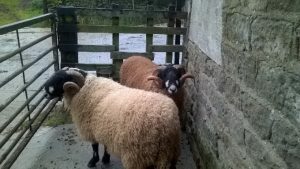 The other tup which we bought has more common blood in, but it is a smart tup and we hope that both of them will produce us some tups to sell in the future.